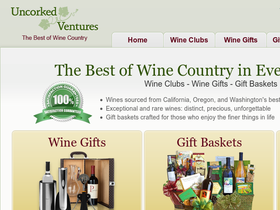 Uncorked Ventures, online at UncorkedVentures.com, offers you a choice of three different wine clubs. Let Uncorked Ventures search the wine market for the best wines at the best prices, and have them delivered directly to your door. Enjoy rare and hard-to-find wines on a monthly or quarterly basis from Uncorked Ventures. Visit 58Coupons to learn about the best Uncorked Ventures discounts, Uncorked Ventures promotions, Uncorked Ventures coupons and Uncorked Ventures savings from UncorkedVentures.com. Pay only $40 per shipment when you sign up for the Wine Exploration Club at Uncorked Ventures and enjoy 2 bottles of quality wine. Click link to get started. For $195 per shipment Uncorked Ventures will find you the best in reserve wines and send you two bottles at a time. Click link to learn more. Sign up for a wine club membership as a gift, and give someone 1-12 shipments of excellent wine. Click link for details.